The nicely packed box this came in included more than just the monocular nighttime viewing device which is always nice. There was also a nice pleather type carrying case which will do a good job of helping you protect and carry your new night vision purchase as you make your way to your hunting spot or when storing it. There is no assembly required at all with this product. The only thing additional you will need to purchase and install are the 3 AA batteries that it takes to make the infrared beam work. Its design makes it small enough that it can just about fit in the palm of your hand. The preset adjustments are also very ergonomically placed on the unit. This night viewing device is not fancy but you would definitely expect to pay more for how well it works. This Xgen model nighttime viewer was a little smaller than we anticipated but it was still solidly built too. Its compact design also made it very easy to handle and use without feeling like you were carrying a rock with you on your hunting expedition. It weighs only a scant 7 ounces. This is yet another affordable night vision product that I really liked when I took a closer look at it. You really get a lot with this monocular night vision device for the money you spend on it. The nice price point it has also makes it a great entry level nighttime viewing device that makes it economical for anyone who wishes to try varmint hunting after dark for the first time. This product makes it pretty simple to spot and identify game as you scan in front of you during your night time hunting adventure. What you can’t see clearly you can paint up with a stronger infrared signal. This makes it possible for this device to give you a clearer picture of what objects are in front of you that give off even a low heat signature. That makes the Xgen 2.1X not only perfect for nighttime varmint hunting but also for use as a nighttime navigational aid if you are boating. As was mentioned, this monocular night vision product uses infrared technology to help you see at night. It does this in combination with the lenses and preset programs that are built into it. If you are expecting this to be the type of military night vision technology that you see in the movies you will be disappointed but then again that type of technology will cost you several thousands of dollars. Its first generation infrared technology is more than adequate for spotting and identifying game at night while you are hunting. As I used it I noticed some of the targets you can see without enhancing them much at all with the infrared beam that it sends out. This is especially true for objects that have good heat signatures such as feral animals. You will be amazed how clearly they show up with the very good resolution that this device has. This is not to be mistaken for a telescope by any means but it does have a very adequate 2.1x magnification setting. That means you can see objects magnified over twice that of how the human eye is capable of seeing them. Believe me if there is game out there in your shooting range you will spot it and be able to bring it down with a night scope on your rifle with no problems. This monocular night vision system also makes good use of the 20mm lens technology that it uses too. It is of a high enough quality as was stated that you don’t always have to paint your target with a high infrared signature to see it clearly if the object gives off even a minimal amount of heat. Even though its dual lens system takes a little getting used to when it comes to focusing this device, its 5 preprogrammed settings make up for that somewhat and are a nice little feature. They allow you to choose a device setting that works best for you under the current light conditions. 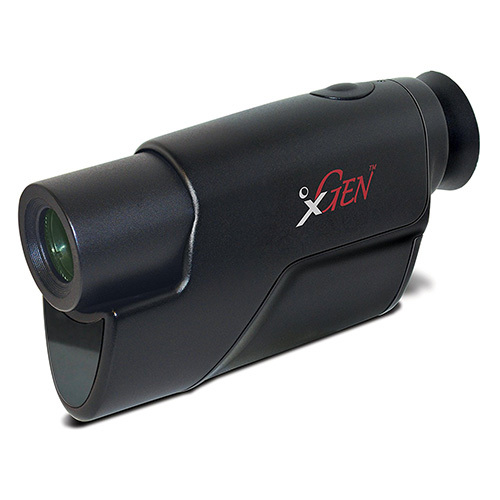 Another nice feature is that not only can this Xgen night vision device see outwards several hundred feet; it can also give you nighttime views of animals that are as close as 3 feet in front of you too. Hopefully if an animal is that close it is not a bear. There is absolutely no doubt about it that the best thing about this Xgen 2.1x monocular night vision product is the price. It is low enough that now anyone can successfully scan at night for game to hunt without breaking the bank. That makes it a night vision product that will allow most everyone entry into night time hunting with a device that is awesome at spotting coyotes, feral pigs, feral dogs and other animals that are considered nuisance and destructive nighttime predators. These are next to impossible to get during the day so if you want to take them down you better be able to be out at night the same time they are. Let’s be completely honest here. I mentioned a few drawbacks with these like the small 20 mm lens and the short scan distance. These combine to sometimes make monocular devices seem like you are looking through a small tube and some people are uncomfortable with using that small view angle to spot game at night. With that being said, you will spot game easily when you use this device and what you spot you will get a clear picture of what it is. After all, those are the two main objectives of any device you will use to identify potential game to shoot at night. That is why I have no problem recommending this device for purchase as a night time hunting aid. Take my word for it; with the price you pay for this night vision product you will not be disappointed with how well it works to enhance any nighttime hunting adventure you are on.